Why 2017 Was a Year to Remember for Facebook Inc.
Two billion users, great share price gains, and political ad turmoil mark the year. There's been a lot for Facebook Inc. (NASDAQ:FB) investors to celebrate this year. The social media juggernaut surpassed 2 billion monthly active users on its flagship platform, saw Instagram dominate its competition, and the company consistently beat Wall Street's consensus revenue and earnings estimates. Not all the new was good, of course. Facebook did some soul-searching of sorts this year, as news trickled out that the company had displayed thousands of political and divisive ads purchased by Russia. All of these things added up to a truly memorable year for Facebook. So let's take a close look at what happened. The biggest pop came in July, when Facebook's shares jumped after the company reported its second-quarter 2017 results. Revenue rose 45% year over year to $9.3 billion and earnings per share reached $1.32. Analysts' consensus estimates were calling for just $1.12 in the quarter. The good news just kept on coming when Facebook reported another earnings beat in the third quarter. This time, Wall Street was expecting earnings of $1.28, but Facebook smashed that estimate with EPS of $1.59. 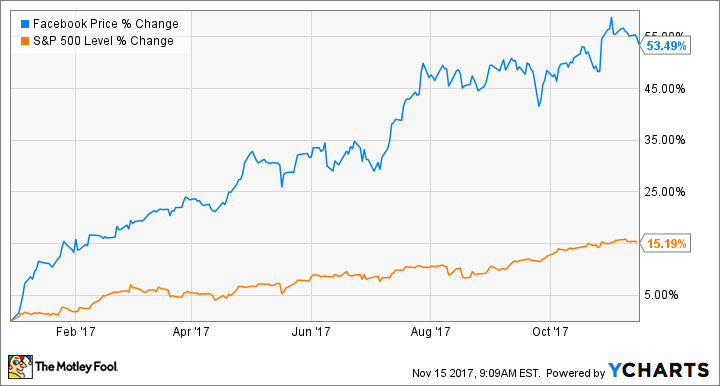 Facebook generally outperformed both analysts' expectations this year and some of its own guidance. The company had expected revenue growth to slow in the second half of this year but, thankfully, that didn't happen. In the second quarter, the company surpassed 2 billion monthly active users (MAUs) for the first time ever. That's quite a feat, of course, and it comes just five years after the company hit the 1 billion MAU mark. Of course, we can't talk about Facebook's user growth without talking about the company's other massive success story: Instagram. The photo and video sharing app reached 500 daily monthly active users, 15 million business profiles, and 2 million advertisers in 2017 (for comparison's sake, the Facebook platform has 6 million). Facebook doesn't break out Instagram's revenue but estimates put it between $4 billion to more than $6 billion this year. Instagram has also also helped Facebook fight off social media newcomers like Snap Inc. For example, Instagram essentially copied Snap's Stories feature about a year ago and now Instagram has 300 million daily active users for its own Stories feature, far more than Snap's 178 million total daily active users. I can't mention what happened with Facebook this year without talking about Russian ads that were purchased across the company's platforms last year. Facebook said that an estimated 10 million people in the U.S. saw at least one of the thousands of ads that were purchased by Russia to fuel American political strife online. The 2016 US election was the first where evidence has been widely reported that foreign actors sought to exploit the internet to influence voter behavior. We understand more about how our service was abused and we will continue to investigate to learn all we can. Facebook isn't the only company receiving a bit of a black eye because of this right now. Twitter has revamped its advertising policies because of the same problems and deleted thousands of fake accounts as a result. The social media juggernaut isn't quite out of the woods with all of this yet, but Facebook is taking solid steps toward improving its advertising policies. It hasn't impacted Facebook's shares, but the changes will likely (and should) have a lasting impact on how Facebook views its advertising platform. While Facebook has had a good year overall, particularly for its investors, it's worth noting that the company is forecasting that total expenses will increase by 45% to 60% for full-year 2018, compared to this year, and that capital expenditures will nearly double. Additionally, revenue growth is expected to slow down as the company invests more in artificial intelligence, augmented and virtual reality, and video content next year. Despite that, though, there's little that Facebook investors should be worried about right now. The company's strong 2017 is putting the company in a good position for next year and the investment moves it's making right now should keep it on the right track in 2018 and beyond.